Leya is probably the stereotypical Toku- silent and observant. She would make a fine Alpha if there ever came a time for that, however she does have the problem of an extra tail. she submits and listens well to authority in the Toku hierarchy and knows enough to respect others. A impenetrable fortress, she is unlikely to tell you anything other than exactly what she desires to. She’s stiff and knows how to follow the rules precisely and flawlessly. Her execution is flawless and her logic perfect, for that is how she views the world. Someone has to take charge and make sure things are going smoothly, or the world would fall to chaos. Despite this, she’s had a slow change come over her, as with the help of a fellow packmate she’s come to realize that life isn’t meant to be taken seriously. There are some things about it so ridiculous that you have to laugh. True to her nature, she’s having trouble transitioning to a more playful lifestyle and will never live a 100% worry-free life. All the same, with time and persistent friends she’s been able to loosen up her standards slightly, letting go a little bit more each and every time. She’s got a long way to go yet and you by no means may call her a goof, but she will smile from time to time and try to use her heart, not her head, to make decisions. Stepped out of the ocean in a fashion similar to Venus, she embodies the tumultuous seas and all the personality of a woman. Large eyes are a soft green reminiscent of lush, tropical islands. Her frame is femininely soft with long legs tapering off to delicate, surf-sprayed toes. What fur she has is short and sleek, akin more to a smooth-coated hound than any wolf or fox. Churning white waters mask her face and splash up her belly, where they are met with rolling seas of sun-soaked blue. The blues plunge to stronger depths along her haunches, becoming a dappled wash of light and shadow. A thick mask of navy spreads across her eyes and up into her ears, running down the crest of her head and tracing her spine to the base of her four tails. It jumps ship along her shoulders, rushing out in a swirl amongst her shallow turquoise sides. The same hue polishes off her body by extending from her wrist to her elbow. Most strikingly, her wings are of the fairy variety, specifically an aquatic queen. By some gift she can fly, and it is a true feat as her wings appear to be composed entirely of water. It drips off her body but never dampens her fur, and should a hand pass through it you'll find yourself soaked. The fluidity still retains the shape of butterfly-like wings, if not in constant motion. Where does this water come from? Even she does not know. Udia is tiny for a Toku. As dainty as her form is there's nothing traditionally beautiful about her. Her coat is always unkempt and ragged and her markings give her the illusion of always being just a little bit dirty. It's no wonder, though, with her high energy levels and tendency to act on a whim. Her coat is a simple, dusty reddish color, darkening on the underside of her belly and neck and at her feet. 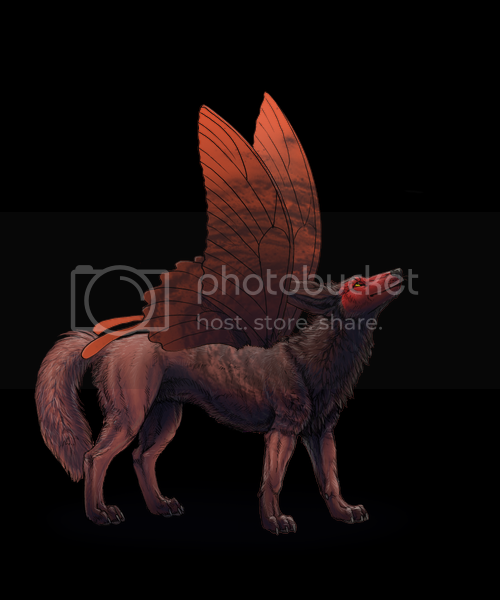 Her wings are a happy orange color, but both these and her fur are flecked with a muddy brownish color, concentrated more on her front end and wings than her back and tails. Her most striking feature is the bright red mask that covers most of her face, encircling brilliant yellow eyes. This omega is of the wild and free spirit sort. She allows the wind to take her where it will, acting always on any sudden whim that might occur. She's much more likely to start a hundred projects than to finish any of them. Beginnings, like sunrises, are her favorite. They are full of hope and new possibilities and that thrill of learning something new will always be relished deeply. To her bond, she is always offering up her opinion (though her flighty nature can sometimes be a little contradictory). She can be quite encouraging, especially when the course of action involves spontaneity, a thrill or gets you to act a little out of the ordinary. She is not the most affectionate or even inclined to hang around you all the time, but know that the spark that lit when she found you burns deep within her and you will have a fierce friend when you need it.